Okay, I know this is a horrible picture. I will add another one tomorrow when we dip into it. This is a very flexible recipe and many things could be subbed for the brownies such as oreos (so yummy!) or any other cake/cookie that would work with chocolate. I think adding cherry pie filling would be awesome too (think black forest cake!). 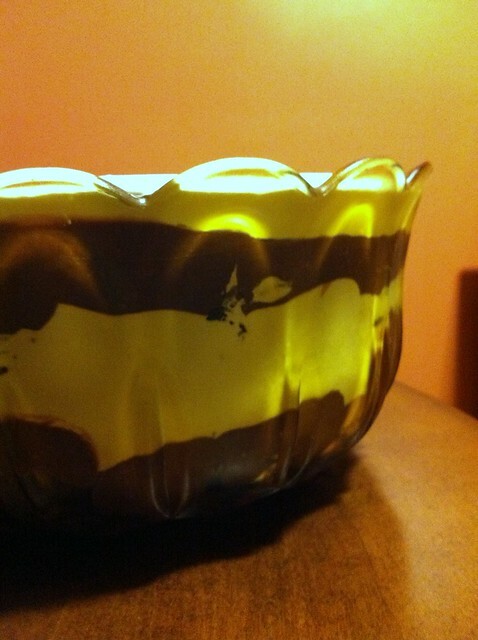 Crumble brownies into the bottom of a large bowl or trifle dish. Layer half of the pudding on top and cover with half of the Cool Whip/whipped cream. Repeat layers with remaining ingredients. Refrigerate overnight. Easy peasy but a big hit especially with the kids.